You can have your pumpkin pie and eat it, too -- if you follow these rules. camera (Getty Images) Start at the healthy end of the buffet. 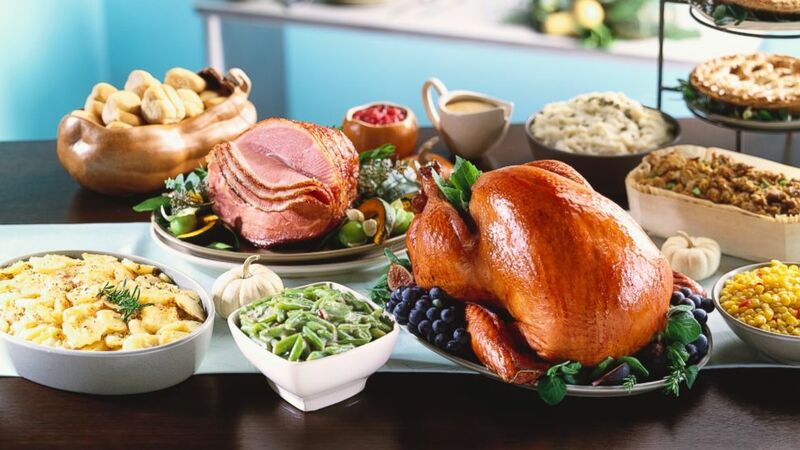 intro: Thanksgiving is every dieter's nightmare: turkey slathered in gravy, candied sweet potatoes with marshmallows, green bean casserole, cranberry sauce and buttery, calorie-laden pecan pie. Adults gain about a pound between Thanksgiving and Christmas, and they don't lose it in January, according to experts. That means that, of the pound or two a year that adults gain as they age, half of it happens over the holidays, said Cedric Bryant, chief science officer of the nonprofit American Council on Exercise. But never fear! We're here to help you strategize so you can enjoy Thanksgiving without overdoing it. quicklist: 1 category: Thanksgiving Strategy title: Exercise Before or After the Meal url: text: Starting your morning with a turkey trot -- a Thanksgiving 5K jog -- will help offset some of the effects of a big holiday dinner, Bryant said. An after-dinner walk or jog is even better. When you eat the calorie- and fat-laden meal, your triglyceride levels become elevated and you blood sugar spikes. This can lead to a feeling of malaise. Over time, it can contribute to metabolic disorders and type II diabetes. Light exercise before the big meal decreases your triglyceride levels -- the fat in your blood -- by 25 percent, he said. Exercising after dinner will decrease triglycerides by 70 percent. "One easy way to do that is just only eat the stuff that’s homemade," he said. "The hostess isn't going to be offended if you don’t eat the peanuts or the nuts before dinner or you don’t eat the dinner rolls she bought. She’s going to be annoyed if you don’t eat the dressing or the turkey." Hosts in Wansink’s research never remembered how much guests ate, but remembered whether they went back for second helpings, he said. quicklist: 3 category: Thanksgiving Strategy title: Make a Few Thanksgiving Swaps url: text: A few simple substitutions can go a long way on Thanksgiving, Bryant said. "Choose white meat over dark meat," he said. "The white with no skin is going to be about half the calories and probably 1/6 to 1/7 the fat of dark meat with skin." A six-ounce serving of skinless white meat is only about 180 calories and 3 grams of fat, Bryant said. By comparison, the same serving of dark meat with skin is 370 calories and 20 grams of fat. Choosing pumpkin or apple pie instead of pecan pie will save about 150 calories, he said. quicklist: 4 category: Thanksgiving Strategy title: Start at the Healthy End of the Buffet url: text: People load up 60 to 65 percent of their plates with the first three things they see at the buffet, Wansink said. To save calories, start near the salad and vegetables. And if you're hosting the dinner and want to save your guests from overindulging, keep the buffet away from the table so people have to consciously get up to get second helpings. People who served themselves from a buffet ate 20 percent less than people who served themselves from the middle of the dinner table, he said. quicklist: 5 category: Thanksgiving Strategy title: Eat Slowly and Drink Water url: text: Bryant said absently "shoveling" in food as you catch up with relatives is bound to lead to overeating. Instead, remind yourself to eat slowly and stay aware of what you're eating. "Give you brain an opportunity to catch up with your appetite," he said. Another helpful trick is to drink water throughout the day.